We like to talk with our artists to get a sense of their beginnings and inspiration, as well as their current work and where they see their work evolving in the future. Today, we’re speaking with abstract painter Allison Svoboda, who is the Featured Artist of May. As a child, I was always building things like forts in the woods, exploring the outdoors and collecting objects from nature. I always loved drawing and painting. In high school, I was obsessed with photography. Some kind of artistic expression has always been a part of my life. I worked in architecture until the economic downturn. My partner and I had saved enough so that we could live on $10 a day for the year. As a result, we visited mostly developing countries where we could afford to live. During this time, I became interested in ethnographic textiles and started working with artisans in Indonesia and India. This experience of understanding the importance of craft has had an enormous effect on my process. I saw the Lee Bontecou show at the Museum of Contemporary Art in Chicago in 2003. Although she had shown in New York during the 1960’s, she had been working in relative obscurity for years. Bontecou was in her mid 70’s at the time, and this inspired me. I love the organic shapes in her sculpture and unconventional use of materials. You actively work in a number of different media – ink, watercolor, cyanotype - not to mention many different substrates. How did this evolve, and do you have a favorite? I do work in many different materials, I think this harkens back to my years in India and Indonesia working with artisans. My subject matter is always about light and shadows, the dichotomy in nature; terrible destruction and the power of rebirth. I’m an environmentalist and my work is a meditation on nature and its ability to heal. Tell us about the work in your exhibit at Vivid. 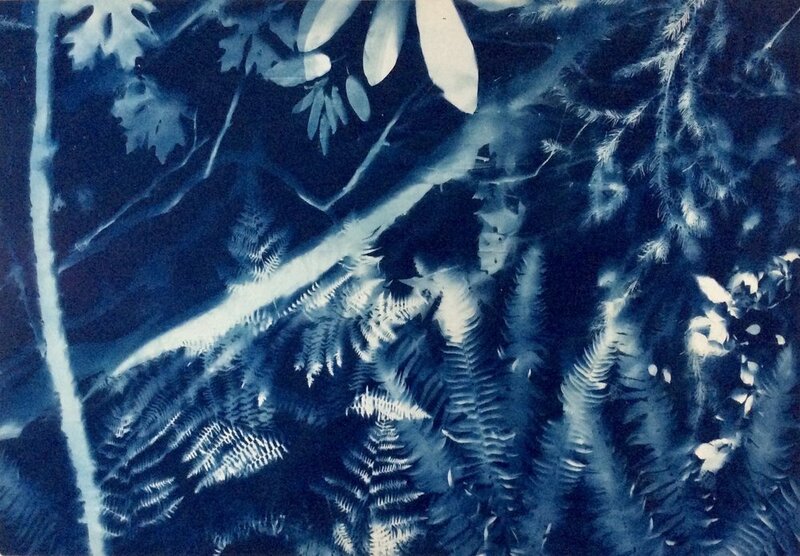 My work at Vivid consists of cyanotypes I did while on a residency at the Studios of Key West. I was there just after Hurricane Irma in 2017 and this work is in response. I walked the beaches and went to the nature preserves collecting debris. The preservationists described the importance of this clearing out of dead during these huge storms and the strong regrowth afterward, not unlike the prairie burn in the Midwest. 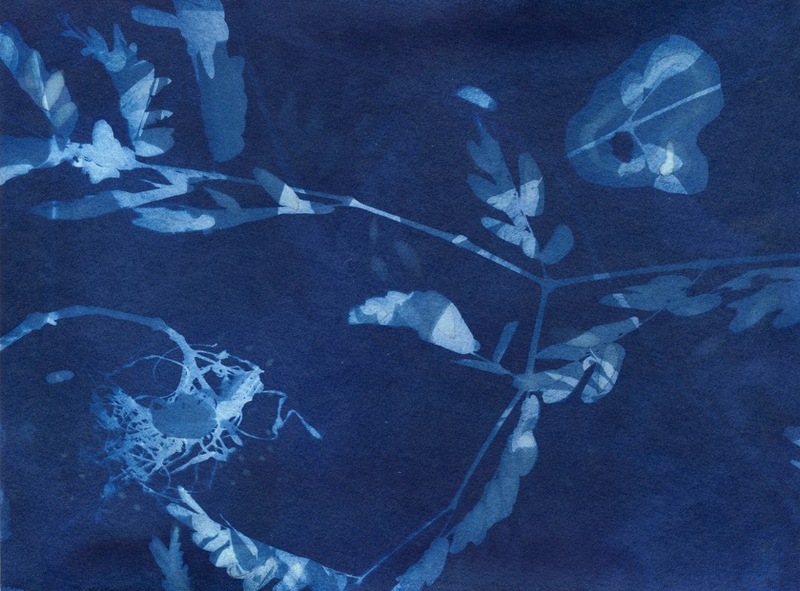 The other cyanotypes are from Bainbridge Island’s Bloedel Reserve near Seattle where I was in residence for the month of September. I was there to study the light in the understory and shinrin-yoku, or forest therapy. The images are taken in the understory of this temperate rainforest, a very different light and atmosphere from the brighter images from the tropical island of the keys. I will be in Basel, Switzerland during Art Basel in June collaborating with Cydney Lewis and local musicians. Our proposal is to work with the community in response to the solstice. The cyanotypes will probably be part of this. Or perhaps a mandala. Or maybe something completely different – that’s the beauty of collaboration.